Ribosomes are the cell’s protein factories. Roland Beckmann and his team have now structurally characterized late stages in the assembly of the human small ribosomal subunit, yielding detailed insights into their maturation principles. Proteins provide the crucial structural elements of all cells and mediate the executive functions required for cell survival. In most cell types, specific sets of proteins must be produced constantly and in widely different amounts. In order to carry out this vital task, the cell must ensure that it has enough of the complexes required for the synthesis of proteins – the ribosomes. Eukaryotic (i.e. nucleated) cells can produce ribosomes in enormous numbers, although each consists of about 80 proteins and 4 ribosomal RNAs (rRNAs). Moreover, some 200 other proteins known as biogenesis factors are necessary to ensure that the assembly process takes place without a hitch, and that all components of the functional ribosome find their proper places in its complex architecture. 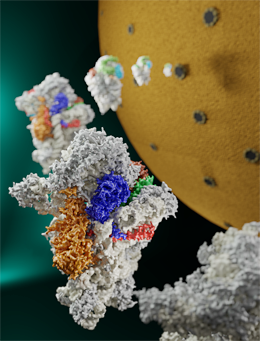 Roland Beckmann and his team, have now determined, at high resolution, the three-dimensional structure of several assembly intermediates that are formed during the later stages of ribosome formation in human cells. Their data reveals in detail how the ribosomal RNAs are progressively folded to provide the necessary binding sites for the cognate ribosomal proteins. The findings are reported in the latest issue of the leading journal Nature. Visualizing late states of human 40S ribosomal subunit maturation. Ameismeier M, Cheng J, Berninghausen O, Beckmann R.
Nature. 2018 Jun 6. doi: 10.1038/s41586-018-0193-0.